To continue the discussion, begun in the last post, of whether an evolutionary process is inconsistent with the character of God as revealed in the Bible—and, specifically, whether that inconsistency arises from a “brutal” and “wasteful” process being used to produce humans—the Bible does not, to my understanding, teach that all other life on earth was brought into existence for the sake of humans. Rather, it teaches exactly the opposite. In the Genesis account, while the man and woman are told to “fill the earth and subdue it,” this must be understood in a sense imitative of God’s creative activity in restraining the wildness of the unformed universe and creating order and harmony. The same responsibility is in view when the man is put in the garden “to till it and keep it.” In other words, the special place of the human within creation (to anticipate our next discussion a bit) is to serve and bless all other life. So we should understand that God views all life as valuable in itself and for its own sake. If God had brought simpler forms into being essentially as means of producing humans through evolution, even if this had been done in a much more “efficient” way than natural history records, this would have been inconsistent with the biblical portrayal of God. But to have caused a profusion of life to have flourished in various eras is not. But what about the extinctions, some of them massive? Are not these incompatible with the work of a God who loves life so much? Not according to the Bible, which tells us that the same God who surveyed creation and proclaimed it “very good” later sent a great flood to “blot out from the face of the ground every living thing” (Gen. 7:4). These actions are not incompatible because it is possible to bring something about initially as an end in itself, but then subsume it to a higher end. It may be because of this problem of theodicy, in fact, that the earlier reviewer of our book who suggested the questions I’m taking up here spoke of “the loving, compassionate God revealed in the mission of Jesus of Nazareth,” rather than more generally of the “God revealed in the Bible.” Jesus certainly did reveal to us the love and compassion of God, supremely when he gave his own life for our salvation. But Jesus exhibited the qualities of both justice and mercy, in keeping with the self-disclosure of God throughout the Bible. Jesus drove the money changers out of the temple with a whip (John 2:13-22 and parallels), prophesied that Capernaum would be cast down to Hades (Matt. 11:23, Luke 10:15), and warned that the scribes and Pharisees would not escape Gehenna (Matt. 23:33). Once again we must wrestle honestly and thoughtfully with the full range of the divine character as revealed here. But as we do, we will recognize that it is reasonable to suppose that God, as revealed in the pages of Scripture and specifically in the person of Jesus, would have employed a process such as evolution, which features both the lavish flourishing of life and small- and large-scale extinctions. A final consideration we may introduce in a more positive light, as we ask whether God might have used a process such as evolution, is that the Bible describes it to be typical of God to begin a new thing by starting with something that already exists. It may be recalled from this post, for example, that the book of Genesis is really a story of “generations,” that is, what one person or thing after another “generated” or brought forth. Moreover, the various covenants that make up the story of redemptive history grow out of earlier covenants, adapting and modifying their provisions. On an individual level, when God invites a person to enter His service, He typically asks, “What is in your hand?” This was God’s question to Moses, for example, who wondered how he would win the support and trust of the people he was called to deliver (Exodus 4:2). Similarly, when a widow cried out to Elisha for relief from a creditor, he asked her, “What do you have in the house?” (2 Kings 4:2). When Jesus fed the multitudes, he began with the five loaves and two fishes that a little boy had brought. The Genesis creation account itself is one of God shaping and ordering an already-existing chaotic mass, rather than one of strictly ex nihilo creation (creation out of nothing). So it is not inconsistent with the biblical understanding of God to believe that He created a diversity of life through a process of modification and adaptation. All of these considerations show that it is not unreasonable to believe that the God revealed in the Bible would have worked through a process such as evolution. 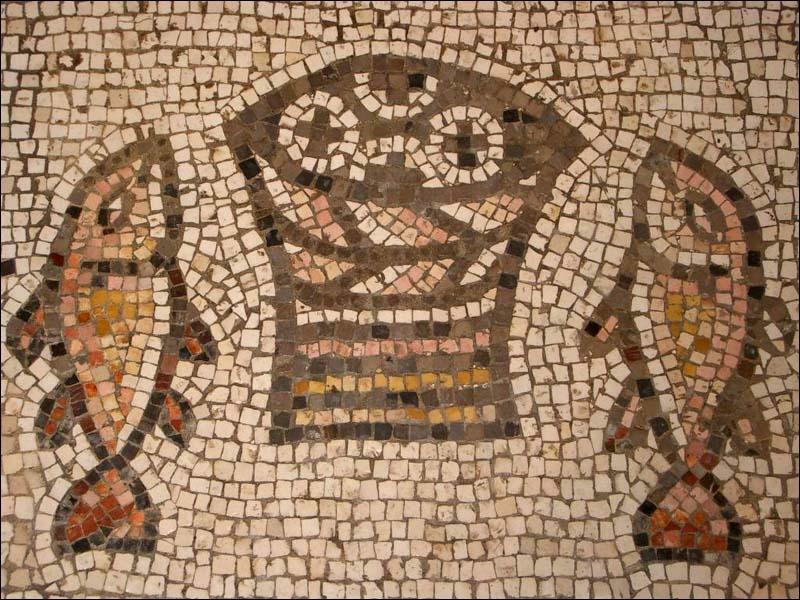 A mosaic of the loaves and fishes that Jesus multiplied to feed a crowd of thousands. Jesus began this miracle by asking his disciples what they had on hand. John Walton claims (and I agree) that God’s act of creating (Hebrew bara) consists of (in my words) starting with a pile of something and separating it into 2 piles with different functions. I see this as extremely close to the idea of speciation (where one species branches into two) in the theory of evolution. Walton’s book The Lost World of Genesis was published four years after ours, so I didn’t have the opportunity to discuss it in the course of my review of various understandings of the opening creation account. I plan to do one or more posts about it here once the original Paradigms on Pilgrimage finishes running. I think it does make a valuable contribution to the conversation. Previous Previous post: 40 Is the evolutionary scenario brutal and wasteful, and so inconsistent with God’s character? Next Next post: 42 How can humans have a special status within creation?